In this chapter, we show how Hedegaard’s ideas on recurrent demands in practices and the emergence of motive orientation have helped reveal the dialectical formation of teachers as professionals with purposes and commitments. To do so we have examined the unfolding of teachers’ agency as professionals in two studies: during their initial training and when employed as practitioners. In both studies we observed differences in how agency was exercised in response to the demands encountered. In order to explain these differences we have distinguished between whether actors navigate practices, i.e. find ways around recurrent demands, for example, by ignoring them or by simply complying; or whether they negotiate their own intentions and commitments into their responses to the demands, thereby demonstrating the dialectic relationship that marks agentic engagement in and with practices and the emergence of engaged motive orientations. These distinctions have allowed us to nuance notions of motive orientation, connecting it with the concept of agency. 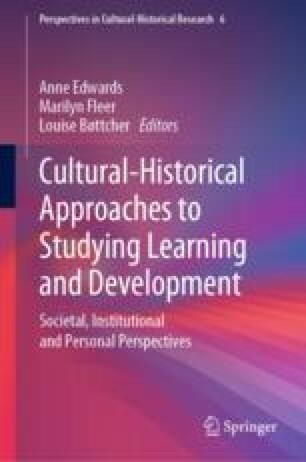 We draw out implications for professional learning by conceptualising professional development in terms of the social situation of development, where it might be expected that learners agentically create their own social situations of development as they propel themselves forward as learners.